Your privacy is our primary concern, we (My Newsagent Limited) have implimented advanced hardware and software techniques to make this website and the data that we hold as secure as possible. Any payment information is only available to our payment processor, it is not available to us (My Newsagent Limited) or your newsagent. Our staff and your newsagent are clear in the understanding that information is held and treated in accordance with the current Data Protection Act. The information you provide to us is not provided to any third party under any circumstances, only we (My Newsagent Limited) and your newsagent have access to your information. Whenever we participate in mailing programmes (electronic or traditional), we operate a strict policy of only delivering to "opt-in" customers. You have the option at registration to receive no contact and you have the ability from your account page to opt-in and opt-out at will whenever you wish. Your newsagent has the ability to send you newsletters (limited number per month) and communications, you have the option via your account page to stop newsletters being sent to you, this facility is totally in your control. 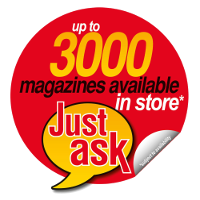 * Only your newsagent has access to this information, no other newsagent can access your details, these details are provided to your newsagent to assist in the efficient processing of your requests and orders. No cookies or sessions used by this website are used for any purpose or in any way which would contravene EU Law, the Data Protection Act or affect your personal privacy. We (My Newsagent Limited) provide no alternative to using cookies and sessions, put simply "the website would not work effectively without cookies and sessions". We can only assure you cookies and sessions are used only for legitimate purposes.